It was a clean Virginia sweep in the shuttle hurdle relays on Saturday. On the boys side, Oscar Smith (VA) stole the show with their US No. 4 all-time performance, running 29.02 for their second straight New Balance Indoor National Championship in the 4x55m Shuttle Hurdles. The squad improved their old school record by 0.36 seconds as they continue to close in on the national, meet, and armory record set by East Orange (NJ) in 2017 (28.62). Oscar Smith is led by US No. 1 55 and 60m hurdler Kurt Powdar. 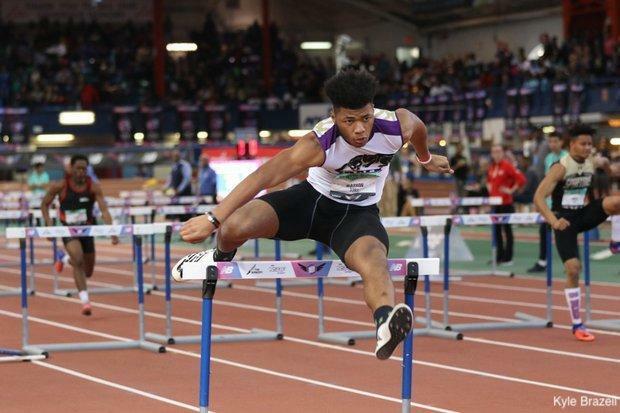 Powdar has run 7.04 in the 55m hurdles and 7.61 in the 60m hurdles this season and, earlier in the day, ran the fastest time out of prelims in the 60s with his 7.63 mark. Aaron Shirley, Shymeek Dixon, and Kevaughon Watson rounded out the squad. 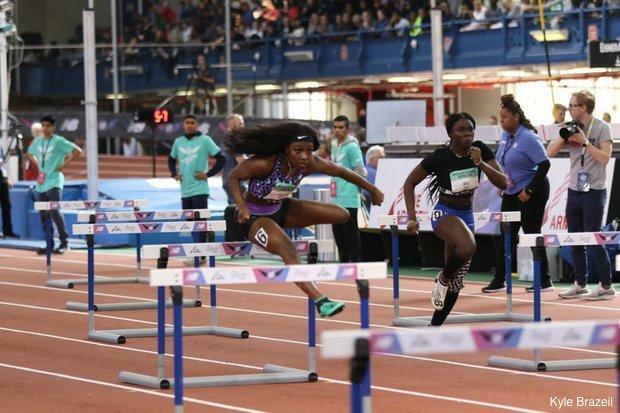 Though Oscar Smith missed out on a national record, Western Branch (VA) would not be denied as they became the first 4x55m Shuttle Hurdles squad to break 30 seconds in the event. Their 29.82 broke Bullis School (MD)'s 30.44 record from last March. Led by the Ballard sisters, Shadajah and Na'Taja, the ladies of WB TC battled it out with Bullis in the final heat, but looked absolutely dominant en route to their second and a half victory. Speaking of the Ballard sisters, we have already seen them put on a show in the open events this weekend. On Friday, Na'Taja brought home the victory in the Emerging Elite 60m Hurdles in an Emerging Elite meet record 8.49. This was also a US No. 11 mark. This morning, Shadajah ran the fastest time out of prelims in the Championship 60m hurdles with her US No. 1 8.24. Also on the squad today were US No. 8 55m hurdler Jazmine Tilmon and another top 50 hurlder in the US, Adriana Shockley.